As most of you probably already know, The Simpsons has been a global hit for over 25 years. The show was first translated into other languages in 1990, when it was dubbed into Spanish and Swedish, with Italian and Quebecois French versions following shortly after. Since then, it’s been translated more than a dozen times, and been a huge hit pretty much everywhere it’s been broadcast. But in Georgia, apparently, they have to be different. In Georgia, rather than just dub the American version of the show, they went ahead and made their own version of The Simpsons. 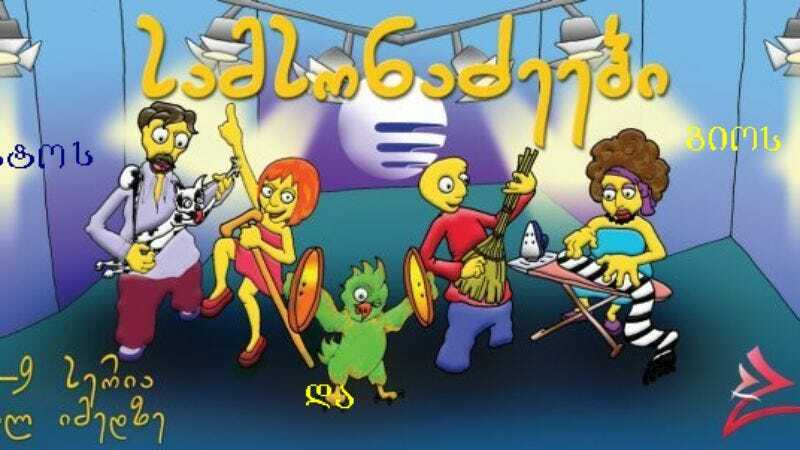 The Samsonadzes—which creator Shalva Ramishvili has taken great pains to explain is not a rip-off of The Simpsons—features a yellow skinned cartoon family lead by a dopey, chubby dad and an mom with a huge beehive hairdo living in Tbilisi. The show does differ from The Simpsons in a few key ways, though: Gela Samsonadze works at a bank, not a nuclear power plant; there are only two Samsonadze children, and they’re teenagers; they have a talking parrot; and they occasionally accidentally foil Vladimir Putin’s spy plots. As a bonus, the whole thing looks like it was animated by a high school computer class circa 1998.